The program is in support of the “Safe Trip Mo, Sagot Ko” project of the Metro Pacific Tollways Corporation (MPTC,) which aims to promote and ensure the safety of drivers traveling back to provinces via MPTC-owned expressways during the holiday. Prestone announced the launch of its Prestone Roadside Assistance program in time for the Holy Week from April 17 to 21. Those who will pass through the Subic Clark Tarlac Expressway (SCTEX), and the Manila-Cavite Expressway (CAVITEX) from Holy Wednesday (April 17), Maundy Thursday (April 18), Black Saturday (April 20), and Easter (April 21), will be assisted by Prestone mechanics at designated stops. This year, Prestone will also provide services to assess vehicular engines in a bid to lessen road accidents during Holy Week. Prestone booths will offer brake fluid efficiency testing to motorists and administer free top-ups to ensure the safety of drivers with B.L.O.C.B.A.G.E.T.S, a preventive routine that inspects the level of coolants in engines while checking the system for leaks or other issues. Twisting the familiar B.L.O.W.B.A.G.E.T.S, a mnemonic coined by the Philippine National Police-Highway Patrol Group (PNP-HPG,) Prestone seeks to improve the reminder by replacing “water” with “coolant,” highlighting its importance in ensuring trouble-free driving experience. B.L.O.W.B.A.G.E.T.S. means Battery, Lights, Oil, Water, Brake, Air, Gas, Engine, Tire and Self. “While the B.L.O.W.B.A.G.E.T.S. procedure helps drivers assess the status of their vehicles, we believe that one aspect can be improved. Instead of checking the water in your radiator, focusing on effective coolants is a key measure to prevent overheating, especially now that we experience El Niño. So for worry-free driving, we invite drivers to drop by our Prestone B.L.O.C.B.A.G.E.T.S. booths during our road assistance,” said Monique Gonzales, brand manager of Prestone. Prestone emphasizes the value of anti-freeze properties in coolants to prevent overheating. The shift in focus improves the careful maintenance to prevent accidents and vehicular breakdown, especially with the combination of a tropical climate and long-distance travels. Coolants flow through the engine’s critical areas, absorbing heat as it passes the radiator and releasing it out the exchanger. Poor quality coolants or water is not enough to assure the system’s regulation of heat. Aside from top-ups, Prestone will continue to provide free roadside assistance for vehicles this holiday. This includes overall check-up, change oil and troubleshooting of engines. “Many motorists often forget to check their cars before traveling, which can lead to road challenges. We are happy to once again be a part of this initiative and provide safety assistance to lessen accidents. This program is our way of continuing our strong safety commitment through our excellent products and services,” said Gonzales. 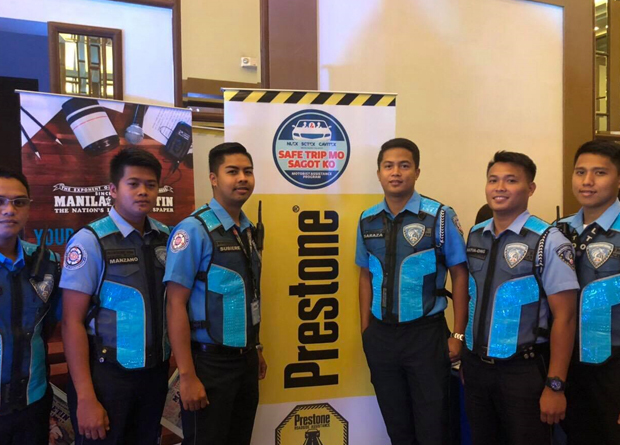 Since 1927, Prestone has been innovating and improving its products for the safety and protection of the Filipino motorists for a worry-free and hassle-free driving every day.